In blender, place cilantro, parsley, tomatillos, 2 cups of the broth, the bouillon granules and salt. Cover; blend on medium speed 1 to 2 minutes or until smooth. Set aside. In 12-inch skillet, heat oil over medium-high heat. Cook and stir onion and garlic in oil 1 to 2 minutes or until onion is soft. Stir in rice; cook 4 to 5 minutes, stirring occasionally, until rice is light brown. Stir in cilantro mixture; cook for 3 to 5 minutes or until incorporated. Stirring occasionally. Stir in the remaining 1 cup broth. Reduce heat to low. Cover; cook 12 to 15 minutes or until rice is almost tender. Increase heat to medium. Uncover; cook about 3 minutes or until liquid is absorbed. Let stand 5 minutes before serving. 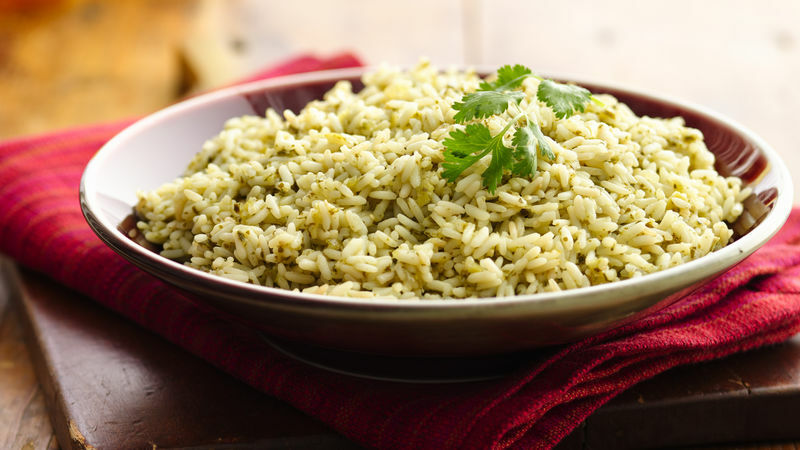 Progresso® reduced-sodium chicken broth provides a simple addition to delicious cilantro-parsley rice– a wonderful side dish.